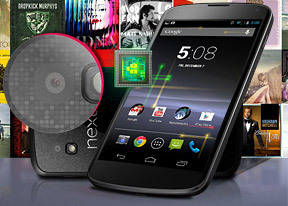 The LG Nexus 4 features a 4.7" True HD-IPS+ LCD screen of 768 x 1280 resolution and 608 nits of brightness. There's about 8% more screen real estate than on the Samsung Galaxy Nexus, the extra surface mostly due to the display being wider. 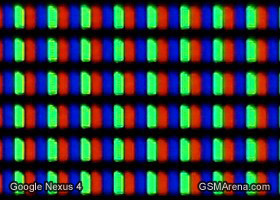 While the pixel density is virtually the same - just under 320ppi - the display on the Nexus 4 is actually sharper due to its RGB matrix, compared to its predecessor and its PenTile Super AMOLED display. Things become clearer once we have both under a microscope. LG uses a screen technology called Zerogap touch - it's basically a laminated screen so there's no air between the screen layers (which causes glare) and it uses in-cell touch technology. The top layer is Gorilla Glass 2 for protection. We put the LG Nexus 4 through our usual display tests and here's how it scored. You can find more about the testing procedures here. 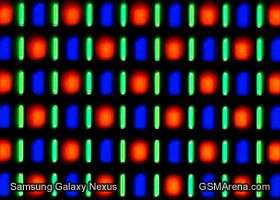 The LCD is noticeably brighter than the Galaxy Nexus Super AMOLED screen and even the new Samsung Galaxy S III, though not quite as bright as the HTC One X. The black levels are not that deep though, especially when looking the screen at an angle. Sadly, the high reflectivity of the Nexus 4 screen leads to a rather mediocre sunlight performance. The Nexus 4 screen is slightly more reflective than that of the Optimus G, possibly due to the different glass. There's only a slight improvement here over the Optimus 4X HD's display. The viewing angles are good thanks to the IPS+ tech, but not without some color and contrast loss. The software that handles the drawing to the screen is noticeably different between the Optimus G and the Nexus 4. On the Optimus, images get their saturation boosted and are sharpened. The result is more visible detail than on the Nexus. The color balance is also different and it seemed to us that it's more accurate on the Optimus G. We compared images both with the native gallery and the Chrome browser, and the results were the same (so it's not LG's custom gallery enhancing the images). The LG Nexus 4 is about the same size as the other Android flagships and offers solid build quality. We do worry a bit that the glass on the back might crack if you drop the phone, though it should be much easier to replace than the front glass, even if the back cover isn't technically user-removable. Drops aside, the double Gorilla Glass protection that the phone enjoys should keep scratches to a minimum (though we actually managed to get ours scratched). The feel of the material isn't up to par with some metal and polycarbonate unibodies but it's way better than the plasticky Galaxy Nexus. We're talking about a $300 phone after all and it does have a more premium feel than its price tag suggests. The thin bezel on the left and right of the screen make the phone relatively narrow (especially when you consider it's a 15:9 screen vs. the 16:9 screens of the Galaxy Nexus, Galaxy S III and One X). The handset feels good in the hand, though we would have liked more tapered edges.